Boatbuilding is in Nick Blake’s blood. 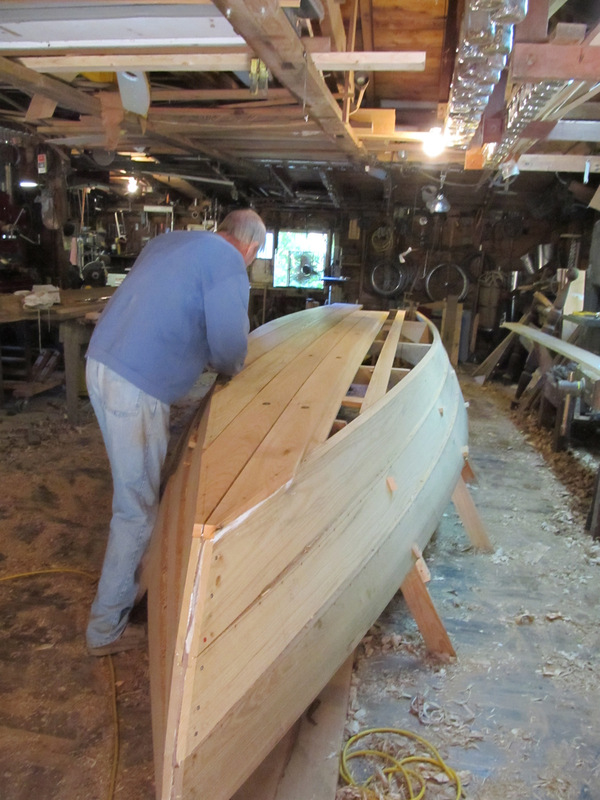 He’s the fifth generation of Blakes to build at least one boat since the Blakes settled in Mississippi in the 1830s. Not long after he launched his 16′ Whitehall, CURLEW, he began mulling over building another boat. He and an old high-school friend had chartered a boat to go fishing off the Gulf Coast. 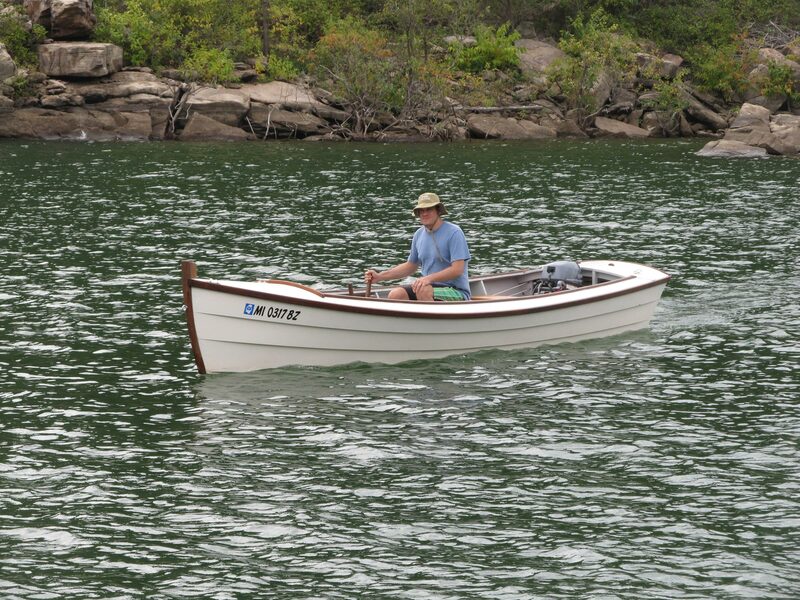 The trip rekindled his interest in fishing—in his teen years he’d fished the Florida coast in OTTER, a 16′ flatiron skiff that he and his father, Daniel, had built from pine boards. It was powered by a 5-hp Johnson outboard, which provided enough speed to get to and from the fishing ground faster and more reliably than sailing or rowing could. CURLEW wasn’t well suited to outboard power, so a new boat was in order. The bottom was planked fore-and-aft with seams backed up by battens. Nick set his sights on a larger version of OTTER, long and slender, easily driven, capable of cruising at 10 knots while carrying 600 lbs. He enlisted his father, who had many more boats to his credit, to help design HERON, as the new boat would be called. The two spent the summer of 2017 studying flat-bottomed skiff designs for inspiration and borrowed elements from Pete Culler’s Long John and William Atkin’s Ration and XLNC. 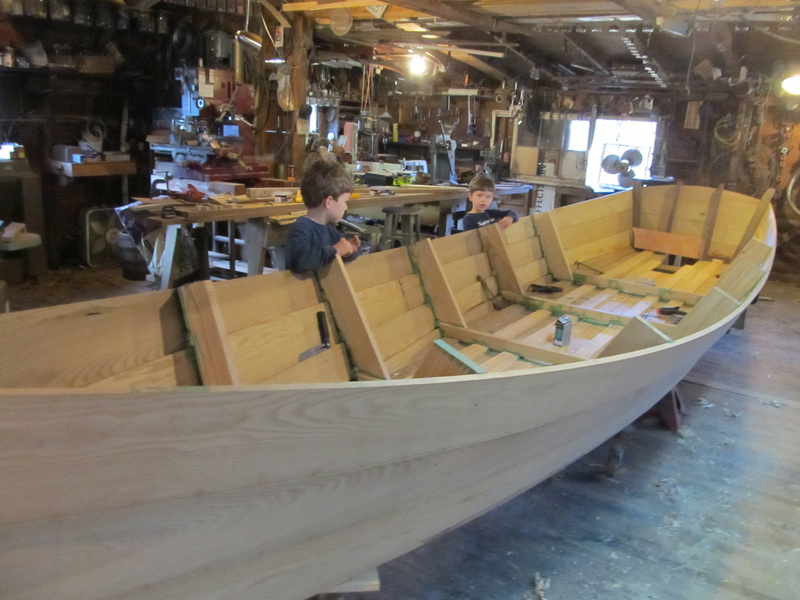 With the shape they wanted in mind, Nick and Daniel got to work, starting with a quarter-scale lofting of what would be a 20′6″ skiff. HERON was built upside down, but instead of building the hull around molds supported on a ladder frame, the Blakes made the permanent frames long and fastened their ends to the shop floor. All of the lumber for the boat came from trees grown on their land and was sawn into flitches with their bandsaw mill. Most of the boat was sassafras; the shoe protecting the bottom was done with locust for its durability, and the stem and trim were walnut for its rich color. Patrick and Andrew take a critical look at the work done by their elders. The sides were done in lapstrake on jogged frames. The bottom was planked fore-and-aft with batten seams, as Atkin had indicated for his Ration. 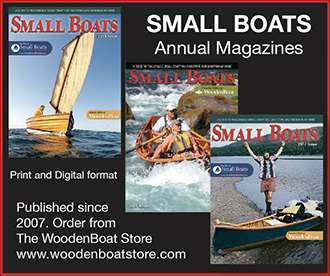 Nick and Daniel had done plywood and cross-planked bottoms with previous boats, and Nick remembered that OTTER, with her cross-planked bottom, leaked after spending time out of the water and he had to soak the boat for a few hours to get the seams closed up before launching. Plywood bottoms, of course, eliminated the seams, but would be best protected by fiberglass and epoxy, materials Nick preferred to avoid. 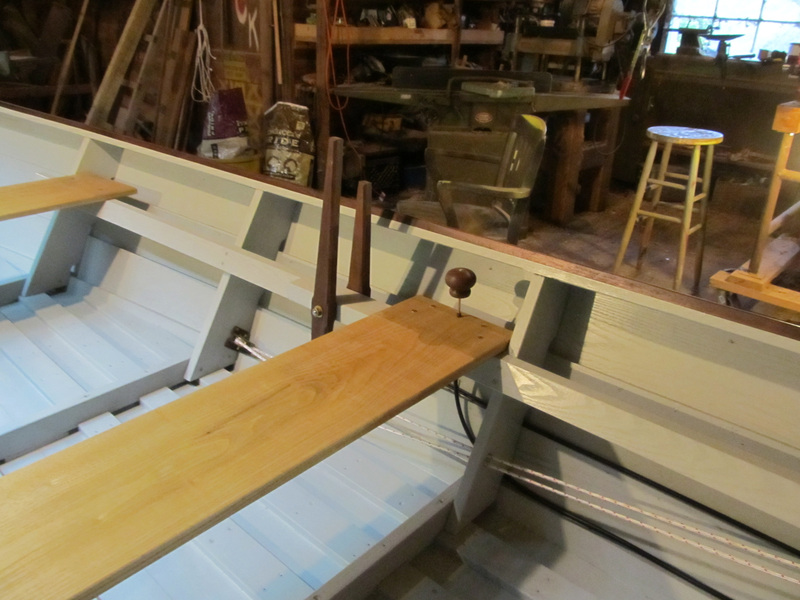 The batten-seam construction promised a watertight, traditional hull. 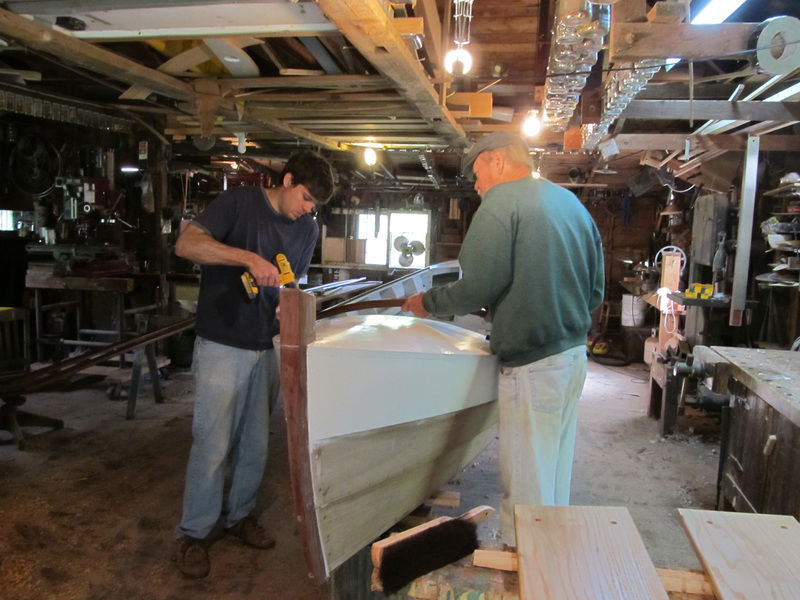 Nick and Daniel install trim as the boat nears completion in the shop they share. Nick also remembered that OTTER was never in good trim when he took her out alone. Without a passenger in the bow to counter his weight and that of the motor in its narrow stern, the boat would squat and lift the bow out of the water. 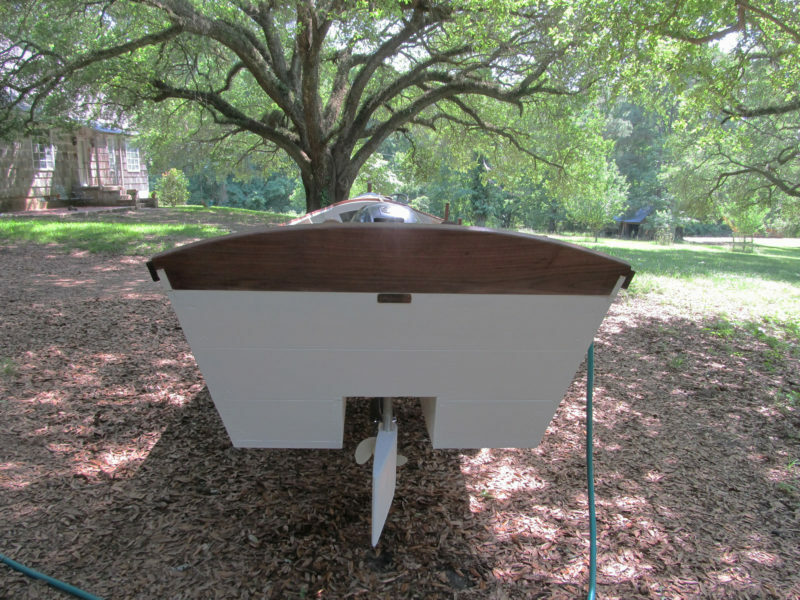 A wider transom would have helped, but “fat transoms,” Nick says, “are a curse of outboard motorboats, and their owners for that matter.” HERON was built with a well to bring the motor’s weight forward. To use a narrow stern and keep the buoyancy surrounding the motor as high as possible, Nick built the slot aft of the well quite narrow, wide enough for the motor’s lower unit to kick up, but too slim to allow steering with the motor. A rudder built into the aft end of the well would take care of the steering. The rudderpost runs inside the transom and is capped with a quadrant that takes the steering lines. The longer lever is a whipstaff for steering; the shorter one is the throttle. Coming up through the thwart is a knob for the shifter. The arrangement takes up much less space than a wheel mounted on a console. Placing the helm at the center thwart moved the pilot’s weight forward, a second measure to keep the boat in trim. The steering lines from the rudder are connected to a whipstaff, a similar smaller lever controls the throttle, and a knob set in the thwart controls the shifter. The rudder occupies the aft end of the motor well. This particular iteration didn’t work as expected. The sixth iteration did. Nick and the boys get HERON up and running on the oxbow lake near their home. 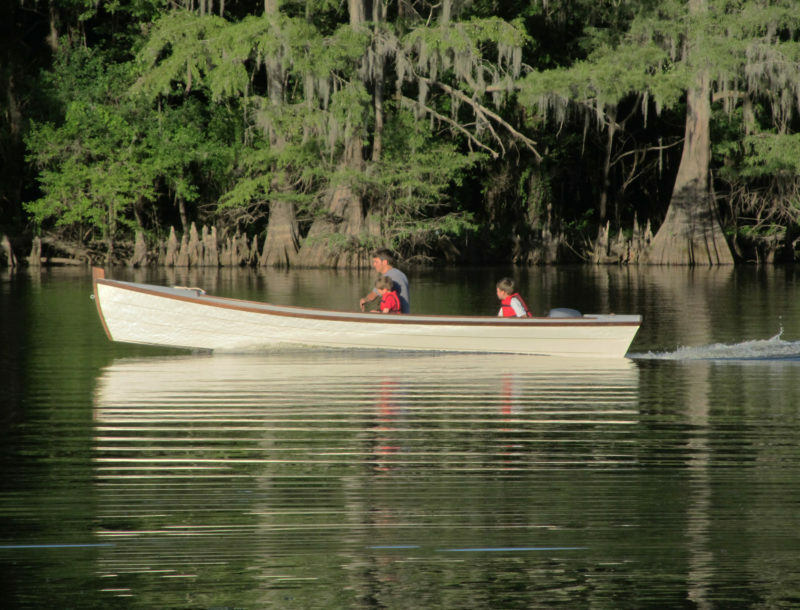 All of the Blake-built boats get their first trials on a small oxbow lake near the family home. During HERON’s first outing, it quickly became clear that the rudder wasn’t up to the demands of the boat. The hard chines at the stern and the immersed edges in the motor-well were great for tracking, but they resisted turning. Nick tried a half dozen different rudder blades, varying both size and shape. The ones that worked best were the ones that extended the deepest, but that made them vulnerable to submerged objects. The solution was to make a long blade that could pivot over obstructions. The first one he tried had a lead weight to keep it extended, but when HERON was at speed, it would swing to horizontal and lose its grip on the water. The second relied on friction to hold it down. Two lock washers created enough spring-like compression on the blade to hold it down, even at speed, but allowed the blade to pivot. Soon after he equipped HERON with this version, Nick ran the boat over a submerged log, and both motor and rudder kicked up, neither damaged. Hand on the whipstaff, Nick takes HERON out for a solo trial. On a later outing, Nick, his wife, and sons Andrew and Patrick took HERON out on a backwater slough. All was going well as the boat motored along until fish started jumping around them. Two 10-lb grass carp leaped up out of the water and landed in the boat. Flopping wildly, they splattered mud, scales, and blood everywhere. Andrew, the younger son, wasn’t at all happy to have the uninvited guests aboard. HERON kept busy with family and friends on a vacation stay on the shores of an Arkansas lake. Nick, his wife, and their two sons took a vacation and trailered HERON to Greer’s Ferry Lake in Arkansas. Nick took the boat out for several trials: outings with his family and fishing trips with friends. When he was the only person aboard, HERON did almost 14 knots; with three adults aboard with fishing and picnic gear, she cruised at about 11 knots. At times, the wind kicked up a bit of a chop, but HERON’s narrow bottom didn’t pound against the waves. At the end of the vacation she had logged 5 hours of running time and had sipped only 3 gallons of fuel. She was, Nick concluded, “well behaved, made decent speed and was stable and burdensome—a worthy successor to OTTER.” And Andrew is happy to get aboard HERON as long as there are no carp. 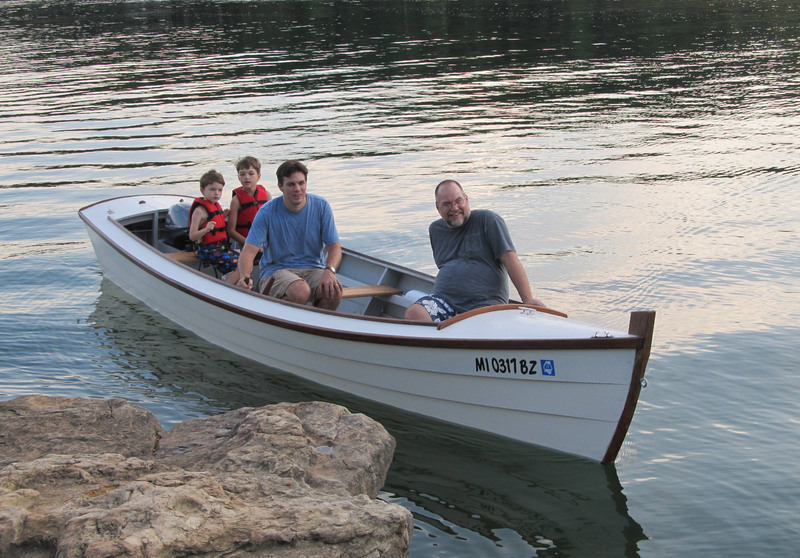 Could have saved some trouble just building a Simmons’s Sea Skiff, but nice boat. Thanks! For us, though, banging our heads against the wall trying to figure things out is most of the fun. Building the Sea Skiff would have robbed us of that opportunity. Great boat by a great guy! Nick is my “nephew-in-law,” the husband of my niece. I graduated from the US Merchant Marine Academy at Kings Point, NY, class of 1970, and graduated with his Dad from H.V. Cooper HS in Vicksburg, MS. Danny and I considered ourselves the class Rednecks. Danny lived ten miles north of town in Redwood community while I lived ten miles south of it in the Redbone community! We weren’t typical rednecks as our parents all were educated, both both our mothers were artists, and were avid readers. I too have had a lifelong love of boats and water. I was active in the merchant marine for nine and a half years, spent a lot of time afloat, but never made a boat. Kudos to Nick and Danny for their great accomplishments! “Acta Non Verba” is the Kings Point motto—Deeds Not Words. Neither were able to go but both would have made the Academy proud! Thanks, Uncle Mark! That is quite a compliment.